Kara- This year, Mother's Day really crept up on me! I have been scrambling looking for good ideas for my mother. I found some creative ideas that I know my mother would LOVE on the Crafty Crow blog. Take a look to find some crafts that your kids can whip up for a fantastic gift for your mother or mother-in-law. I LOVE the handmade flower tiles, I know a specially made tile will be a favorite gift next Sunday! Ashley- Next week is Cinco de Mayo, the You’ve Got Supper ladies have put together a scrumptious meal plan that will you can enjoy all week. The inner-girl scout in me found the Samoa sundae recipe particularly delicious! 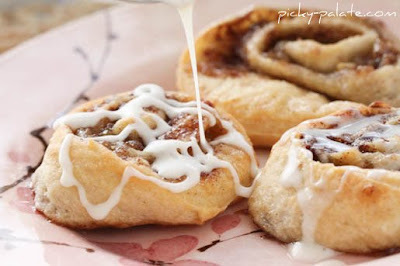 Tracy- My daughter loves anything that is made with cinnamon, particulary cinnamon rolls. I am always on the hunt for the best cinnamon roll recipe. This may be it! Take a look at the Make and Takes blog for the recipe. We know that many of our customers come to CWDkids to purchase clothing as gifts for their grandchildren, nieces & nephews, or for birthday parties, vacations and other and special events. To give you more options, we've added some really fun, new items to our "Gifts" collection. Do you know little girl who loves mermaids? If you are buying her our mermaid capri set, why not add a mermaid beach towel, or include the baseball tooth mate with one of our sports theme tee-shirts for the baseball fan in your family! It's a great way to complete the gift if you are looking for a little something extra. 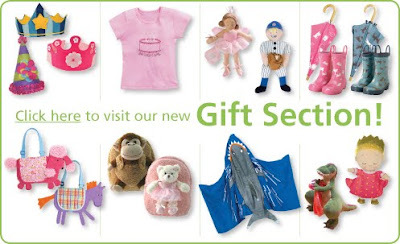 Check out our entire gift selection here! Batter up or should I say butter up?? My youngest son has just started his baseball season. I was headed off to one of his games when my daughter said that she would love to come cheer her brother on. I stopped in my tracks. I could not believe my ears that she wanted to watch her brother play baseball. My heart leaped with joy. Finally, a sign that these kids were going to cease their endless banter and get along! We loaded up to go and she jumped in to the car with her purse. I did think it was a bit odd that she was bringing her purse to the very dirty baseball field, but I did not question what she was up to. We got settled in to the bleachers to watch the game when she hopped up and said she had to get to the snack bar before they sold out of Sour Apple candy straws. Hmm.. yes sirree, she had fooled me. She let me know that she did not really care for baseball, but that she loved the snack bar. She spent the rest of the game slurping on her sour straws and sipping a soda. 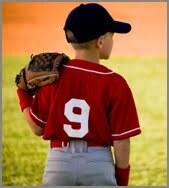 Checkout our CWDkids baseball and sports themed merchandise here! I love this time of year! It is finally warm and I am spurred on to plant our annual pizza herb garden. It is SO easy and my kids love planting their favorite pizza herbs, basil and oregano. I have found gardening to be a yummy way to teach your children about the plant life cycle. It also encourages them to eat more foods that are straight from the Earth! Kara: Earth Day has spurred me to try to conserve on natural resources. Simple Mom has put together a list of easy ways that your family can go green. Take a look and see how you can help save our planet! Tracy: If you have a little girl, you must take a peek at the absolute cutest birthday party!! Blonde Design has put together a Pinkalicious tea party that will make the girliest girls smile! Ashley: I am always on the hunt for great books for my kids to read. I found this list of favorite children's books on the Media Macaroni blog. These terrific picks are guaranteed to hook our kids on reading! April 22, 2010 is the 40th anniversary of Earth Day. This day was started to inspire awareness and appreciation of our Earth’s environment. Take the time on Thursday to teach your kids about our planet and how they can help preserve it. 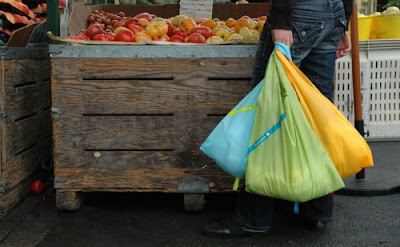 I found some simple ways on the Kaboose website that you can use to teach your children how to take care of our planet by working to reduce, reuse and recycle. As you can see these are easy ways, that your kids can use to help save the Earth’s resources every day. At CWDkids, we try to do our part as well. We recycle paper in our office, we mail out our clothing in recyclable plastic mailing envelopes, and we try to choose clothing that is earth-friendly. One of our favorite brands Mulberribush has recently started to make their tee shirts with organic cotton. Happy Earth Day to you and your family! According to my oldest son, our video game system has died... Oh, I am SO sad about that;) I really felt his pain. NOT! What luck that his PlayStation will not turn on. I feel like I just won the lottery. Look at what my two youngest children created now that their video game days are over! All day Saturday, they had such much fun building this fort and "spying" on their neighbors. They used their walkie talkies to report back and forth all of the unsafe activities that were going on around our neighborhood. The next day, the creativity continued with my youngest son making a miniature golf course in our backyard. Yes, he did almost hit me in the head with his golf ball when he was teeing off..., but I really could not be that mad as he was having such a good time. Now, I know why every child's first lesson really must be when and why you must scream "FORE!" when you have just hit a golf ball straight at your unsuspecting mother's head. The Simple Organic blog has declared this week a "Turn Off Your T.V. and Make Life Happen Week". I am joining in and throwing in my dying gaming device too! 12 Hours Only! Just enter code CGWTDY in the coupon code box during checkout for 12% Off any order (No Minimum!) Start Shopping Now! Kara: Marshmallow fun! Spring usually brings a bit of rain so I am always on the lookout for creative indoor ideas. My children loved making marshmallow sculptures in preschool and I think they will still enjoy this fun activity using one of their favorite confections! Ashley: My three kids have just started playing their spring sports ans we are busy! Click here for three super easy and quick dinners that you can whip up in a pinch from the Simple Bites blog! The chicken fajitas look delicious. Tracy: Occasionally, one of my children wakes up on the wrong side of the bed. This morning, my oldest son must have faller off the bed...and was in a terrible humor. Too bad, I had not found this list of foods that boost moods to put things back on track. Next time, I will be prepared! Richmond, Virginia is absolutely beautiful in the Spring. I am happy to report that winter has finally gone. As you can see in these photographs (taken by our company's President), spring has definitely sprung in Richmond! One of our company's favorite spots to visit in this gorgeous, warm weather is the Lewis Ginter Botanical Garden. Within the botanical garden is a special area for children of all ages. One of the main attractions for the kids is the children's tree house. We are proud to say that CWDkids built this special tree house for kids to enjoy when they visit this very special garden. If you are ever in Richmond, please plan on visiting two of our city's highlights: the Lewis Ginter Botanical Garden and our company store! You will not be disappointed. Today is speech day at my children’s school. Each child had to write a speech and present it in front of their class. This may sound like a great idea for my older two children, but I also have an eight-year-old son! It is not an easy task to coerce a young boy to not play in this beautiful spring weather and write a speech on someone who lived over 100 years ago, Thomas Edison. I hate to say that the boy has taken after his fearless leader, his brother, and really is an amazing PROCRASTINATOR! Yikes, that little fellow waited until the night before to finish his speech. He had me on pins and needles wondering if he would finish. I thought it would be helpful for the little procrastinator to watch his brother and sister give their speeches. Last night, the whole family gathered in our den for the first annual “Speech Night”! Thomas Edison kicked off the event. He shocked us all with a well-written speech. His only hiccup was that he kept introducing himself as Thomas Jefferson, uh, don’t you mean Thomas Edison?? Nerves! He was so cute who really cared who he was talking about. The older two children had been assigned the topic, “What your parents need to know about young people.” Oh come on, what teacher is going to give a loaded question like that to middle school kids. They have been waiting their whole lives to answer this question. My husband and I braced ourselves for their speeches. My fifth grader gave a lovely speech about parents needing to control their kids because often siblings attack siblings, meaning her, and she was fed up with the barrage of Nerf attacks at our house. So far so good, until the fourteen-year-old got up and gave his speech. He wanted parents to know that video games were good for kids’ health, he seems to think you get a lot of exercise working young fingers on the remote controls. He talked about how punishments do not really work and the ultimate blow: parents should not listen to modern music. He seemed to think that I sang like an opera singer to Keisha’s Tick Tock and my singing could damage young ears. I thought I was being the fun mother by letting them listen to their music in my cars. It is 100% NPR in my car from now on! JEWELS, on their sandals, of course! It is finally spring down South and what do I see on all of the young girls? Adorable sandals covered with jewels! Trend Alert! Young fashionistas are enjoying the spring weather and having fun with cute sandals sparkling with crystals. Click here to see all of our footwear that sparkles and shines....it's what everyone is wearing this Spring! 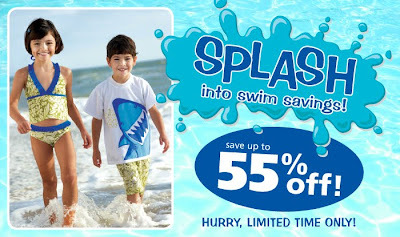 Save up to 55% on Swimwear for a Limited Time Only! Hurry, start shopping now while your size is still in stock! Ashley: How is the conversation at your dinner table? Do you have preteens at home? If you do, you are probably not getting much information or lively chatter at your dinner table. 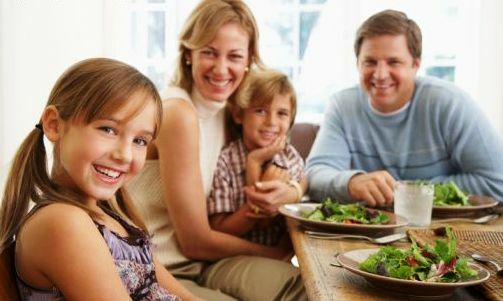 The Skip To My Lou blog put together some fun questions that will definitely get the conversation flowing at your house tonight! Kara: Well, it's that time of year again...do your children's play spaces look like a disaster area? This is the perfect time to do a bit of spring cleaning. 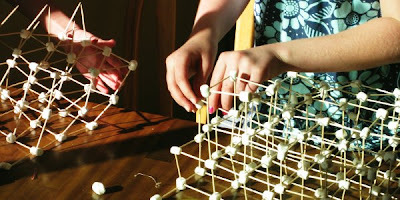 I love the ideas on the Simple Kids blog, particularly rotating your toys. Click here to find some terrific ways to organize and clean out your children's' toys this spring. Tracy: I love a good Easter parade. Unfortunately, I have never been to the New York City parade....it must be quite a show to watch! Click here to see some amazing Easter bonnets captured on Six in the City. I think that next year I need to schedule an Easter trip to the Big Apple! My kids have gone back to school today and that means I am now alone with not one, but three Easter baskets! I have been good the past two days, really good. Mind you, my children were on guard and I could not have nibbled on one jelly bean if I had wanted one. I did want one, but knew better than to ask. This morning, I was all set to dive in to a bit of chocolate with my morning coffee. Who does not like chocolate with their coffee? Until I had to find this unfortunate article in Newsweek magazine, it has ruined my morning. 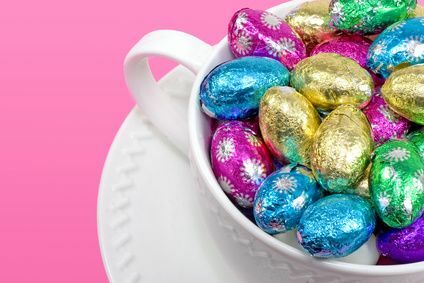 Unfortunately, a writer for Newsweek magazine has listed the eight most fattening foods in your child’s Easter basket. Of course, the Easter Bunny brought all of them to my house. Who knew that a Reese’s egg could be so dangerous? 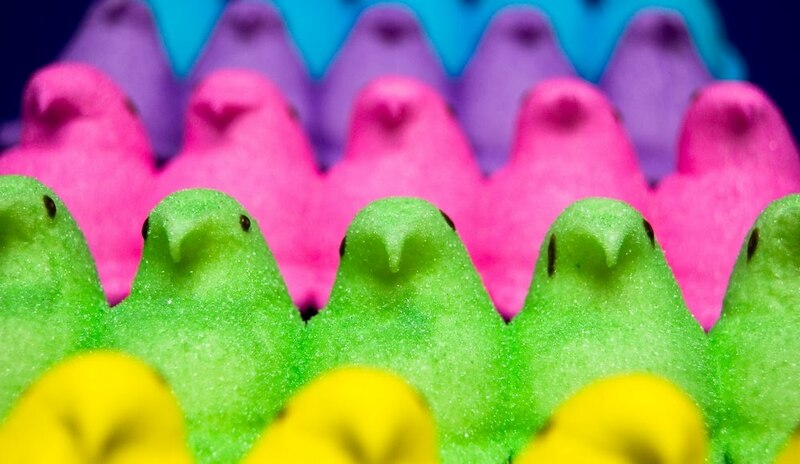 If you want to know which candies are the most unhealthy, click here to read the sad truth. 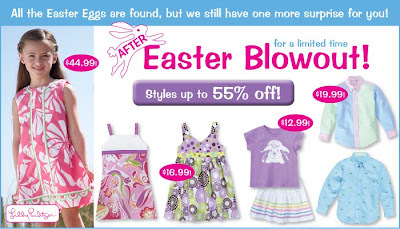 The Easter bunny may have skipped town, but the savings are still around! Buy now for next year at these rock bottom prices....but hurry, this sale is for a Limited Time Only! Guaranteed To Put Mom In A Good Mood! I recently read an article that claimed fresh scents and a clean house could improve your mood. The article went on to tell you to air out your home, spritz a bit of Febreeze, straighten up… and so on. I think we need to take this article's findings a step farther. 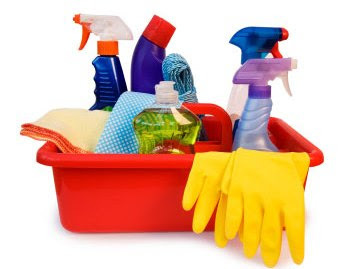 I am confident that most mothers know a cleaner house makes them happier, but what about a house cleaned by someone other than the mother... Now, you are talking! So, I got to thinking, kids (and husbands) need to take this very important scientific finding seriously. Back to where I was going with this one, I know my idea will work. You can’t tell me there is a mother in this country that is not put in a good mood when she walks in to a room that has been cleaned by someone else. It is 100% guaranteed. You must share this secret with your children. I know the punishments at my house will be lighter if my crew reads this article and puts its findings in to action! 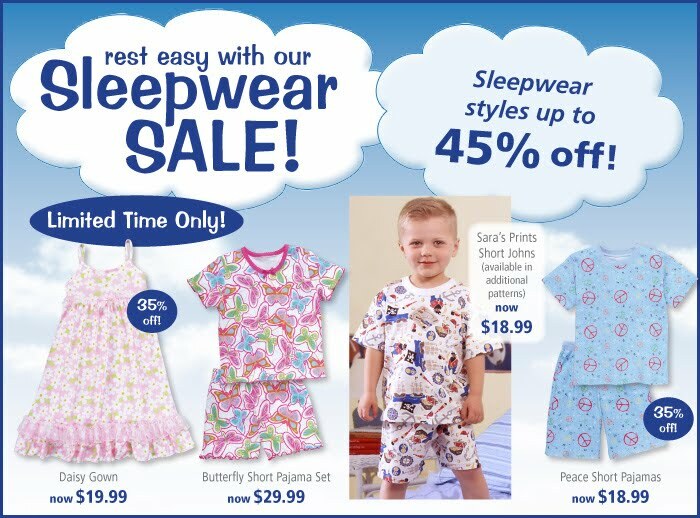 Limited Time Only sleepwear sale! 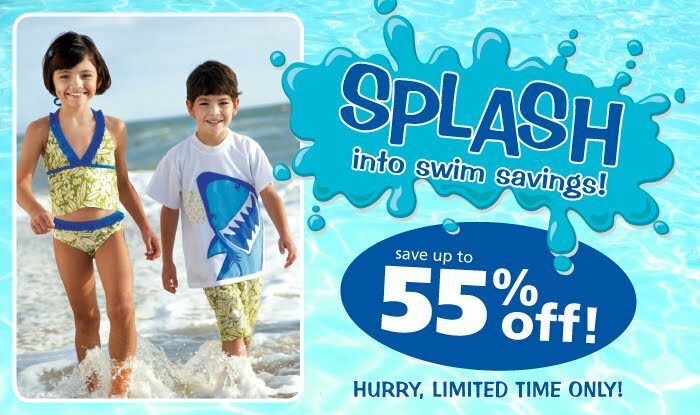 Save up to 45% off our most popular styles. 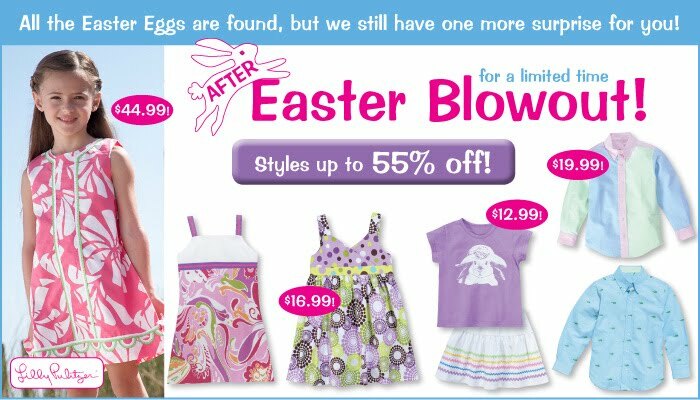 Hurry, this sale won't be around long....start shopping now! Ashley: Wondering what to do with your Easter Peeps? The creative No Fuss Fabulous bloggers have come up with some fun solutions. My favorite is the fondued" peeps! Tracy: These cupcakes are so cute! I think the Easter bunny stopped by with them. If you are looking for a special dessert for Sunday, you will find the recipe for these adorable Easter basket cupcakes on the Family Fun web site. Kara: If you have a crowd coming over for Easter and you need some ideas for outdoor activities, think about setting up an Egg Olympics in the backyard! You will find a plan on the education.com website. Click here to see all sorts of eggstra-special events for you to get your whole family moving this Easter. Are you looking for the perfect book to fill your child's Easter basket? Here is a bunny-inspiring list of children's favorites from Amazon.com. 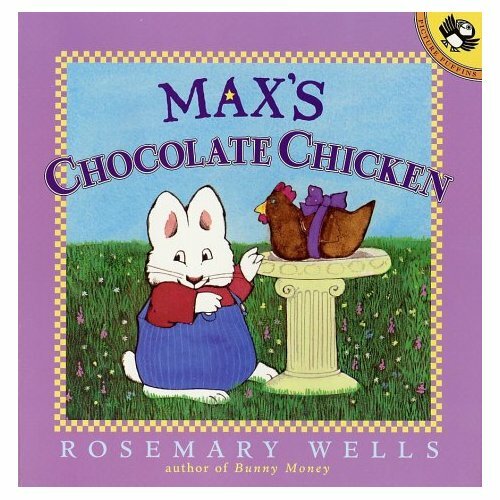 My children’s favorite Easter book has to be Max’s Chocolate Chicken by Rosemary Wells. This is a very funny book that is sure to please any young child. The story revolves around an Easter bunny that likes to hide chocolate in a bird bath and an Easter egg hunt. Your children are sure to chuckle reading about Max’s escapades with the chocolate chicken and his crafty sister, Ruby! Have fun watching the video reading of this book on You Tube . Enjoy!